Full Tilt Poker offers a $600 bonus for all new players. They also offer a valuable VIP program (Edge Rewards), along with many new and exciting promotions each month. The Full Tilt Poker deposit bonus is available to all new players who have not made a real money deposit. All you have to do is create a new account and make your first deposit to qualify. If you already have a Full Tilt Poker account and have made a deposit anytime in the past, you are not eligible for the welcome bonus. However, you may qualify for other promotions. In order to activate the bonus, you must make your first deposit. Full Tilt Poker offers a wide variety of deposit options, which vary based on your location. If you need help making your first deposit, see our review. After making your deposit, you must choose to opt-in to start earning your bonus. To do this, go to the Cashier and click on My Promotions from the Full Tilt lobby. This will open your web browser. Navigate to where you see “My 100% First Deposit Bonus” and click on the button labeled Opt In Now. It’s important to note that while players can clear the bonus by playing poker or casino games, they can not choose both. The bonus is activated based on the first game you play once the bonus is active. For example, if you deposit and play a hand of poker, you must clear the full bonus playing poker. If instead you were to deposit and play a hand of blackjack, you would then have to clear the full bonus in the casino. If you plan on playing poker for this bonus make sure you do not play anything inside the casino until after you play poker! There is no Full Tilt Poker bonus code to enter to qualify for the deposit bonus. At one time, there was a Full Tilt Poker referral code when signing up to ensure you received the maximum possible bonus offer available. However, they got rid of this when Full Tilt re-launched in late 2012 under the control of PokerStars. Full Tilt Poker offers all new players a 100% up to $600 bonus over their first three deposits. So basically, deposit $600 or more and you get $600 free in bonus funds. These bonus funds need to be cleared before they become money you can play with, but that is easy to do. Don’t have $600 in one chunk? Don’t worry! You can deposit whatever you have available now, and then add to the bonus amount over your next two deposits. Let’s say for example you only have $250 right now – well throw that on and you will be given a $250 bonus. In a few weeks, you can deposit another $200 to bring your bonus amount up to $450. Then maybe one month from then you have an extra $150 for the full $600 bonus. 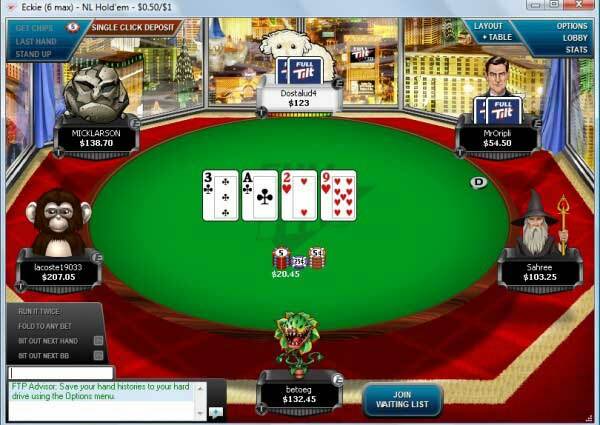 As of September 2014, Full Tilt Poker no longer offers the welcome package for new players. Full Tilt only offers the first deposit bonus. To clear the bonus, play real money cash games or tournaments and collect Full Tilt Points (FTPs). The bonus will clear at a rate of $.04 for every Full Tilt Point earned. This means a total of 15,000 FTPS must be earned to clear the full $600. The bonus is released in increments instead of all at once, which is great for smaller stakes players because it’s not all or nothing. The bonus will automatically be released into your account in increments of $10, or 10% of the total amount, whichever is smaller. Assuming the full $600 bonus, this means that every time you collect 250 FTPs, $10 will be deposited into your account until the full $600 is released. If you want to see your clearing status, click on the Cashier window to view your total cash and select Bonus Account to view your bonus amounts. This will show you how much you’ve released and how much more of the bonus you have to earn. 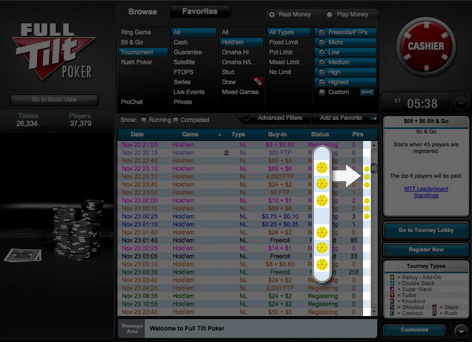 Full Tilt Points are earned through a dealt contributed method. This basically means you earn FTPs based upon the amount of rake you contributed to a pot. Cash game players receive 10 points for every $1 paid in rake and partial points are awarded. For example, in a 9 handed game that you contributed $50 of a $100 pot you would have paid $1.50 in rake (50% of the pot in a $3 capped rake pot) and thus would earn 15 FTPs for your contribution to the rake. If you contributed $30 of a $90 pot you would have paid $1 in rake (33.33% in a $3 capped rake pot) you would earn 10 FTPs. You must be dealt into a hand as well as have had contributed to the pot to earn FTPs. Tournament and Sit-N-Go players earn 10 FTPs for every $1 paid in tournament fees. There is no cap on FTPs earned for a single tournament. For example you would earn 1,000 FTPs for playing in a $5500+$100 Heads Up Sit-N-Go. The chart in the sidebar shows an approximation of how many hands and tournament fees it would take to clear the full Full Tilt Poker bonus depending on which stake and type of game you play. For example, at $50 NL Full Ring, you can expect to grind out 45,455 hands to clear the $600. Note that the ring hands aren’t an exact science. It depends on your playing style. Generally, aggressive players who play more pots will earn points faster. The tournament fees are exact, however. Breaking it down based on tournaments, this bonus is worth exactly 40% rakeback since you get $600 back after paying $1,500. ($600 / $1,500 = .40) The rakeback percent will vary a bit on cash, but is around 30-40%. The bonus expires 60 days after your deposit. Make sure you have enough time to invest during the next 60 days before starting the bonus! It will take the average $50NL player ~45,000 hands, so that comes out to ~5,600 hands per week. The average $100NL player will be a little easier at ~3,500 hands per week. Tournament grinders will need to pay ~$190 in fees per week. Remember, these are minimum amounts. If you can, shoot for more! If you achieve Silver status or above you will receive weekly cash payments which act much like Rakeback. The rate (aka rakeback amount) you earn increases with your level. For example, Silver status earns $1.00 per 100 FTPs whereas Black Card status earns $2.50 per 100 FTPs. Earning 100 FTPs costs approximately $10, so Black Card players earn 25% rakeback. However, this amount can be increased due to other perks in Black Card. For a full break down, see our complete Edge Rewards review. Full Tilt Poker offers various ongoing promotions. Happy Hour is an ongoing promotion on Full Tilt that awards double or triple points on designated tables during certain times. This means you will be earning Full Tilt Points twice, or even three times as fast as normal. However, these points do not increase your rakeback. Any Happy Hour bonus points earned do not count towards other promotions, including Edge Rewards rakeback or clearing bonuses. So even if you are earning twice as many points, this will not clear bonuses twice as fast or award you with twice as much rakeback. Those numbers only go by the base FTPs you earn. That being said, it’s still a great promotion to earn more points. The more points you collect in the same amount of time allows you to purchase bonuses or other rewards faster from the Diamond Edge store. Sometimes Full Tilt Poker holds promotions such as “Happy Hour Week” where all tables award double points. An example of Happy Hour Week was held in late 2012 for the holidays, December 24th – December 31st. All tables and tournaments awarded double points. Stay tuned to Full Tilt so you don’t miss the next Happy Hour week! If your table is breaking during Happy Hour and fits the criteria from above, you will earn triple points. Remember that both you and your friend earn these bonuses. A total of 2,000 FTPs will release the max bonus of $115. Friends you refer must open an account within 30 days, and deposit within 60 days after opening their account. Once a deposit is made, they have 90 days to earn the FTPs for the rewards. Take advantage of Full Tilt Poker’s Promos. The first deposit bonus is only available for new Full Tilt Poker players who have yet to make a deposit. 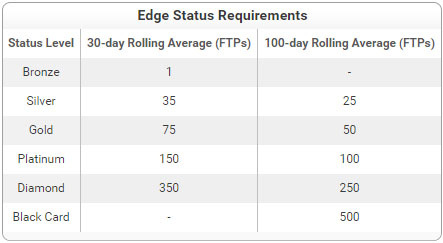 Only base FTPs count towards your clearing rate. Promotions such as happy hour which give you bonus points will not clear your bonuses faster. Any pending bonus amount not earned within 60 days will expire. A fund transfer from your linked PokerStars account will also count as a first deposit. 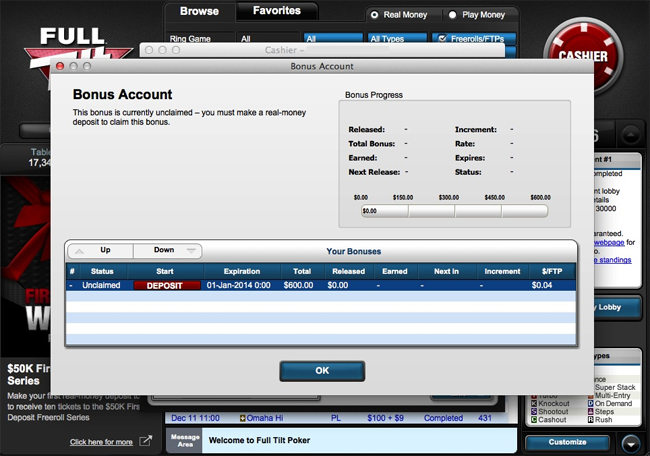 Full Tilt Poker does not accept real money deposits from players in the United States. Every month, FTR players are invited to play in the FTR Tilt 250. This is a $3 buy-in event, held every month on the 15th at 16:00 ET, with $250 added to the prize pool, regardless of how many people show up. That adds up to $3,000 in value, every year. This is a special thanks for our members – don’t miss out! The password is released in our forum, and to see our current events see: FTR Exclusive Events & Offers. Full Tilt Poker has one of the fairest bonus policies you will find online today. The amount is good and attractive to both new players and seasoned grinders. They give you plenty of time to clear it. Their VIP program and consistently new promotions will keep you around for as long as you play poker. We highly recommend the Full Tilt Poker bonus. 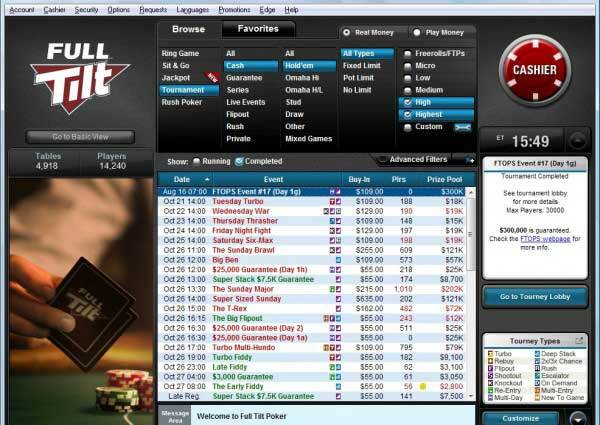 If you haven’t yet taken advantage of it, signup at Full Tilt Poker here!